How GST Will Influence Insurance Sector In India? Finally, Goods and Service Tax bill has launched in India. From now on, all types of indirect taxes such as service tax, excise duty, sales tax along with other local and state taxes will merge into one single tax called GST. With the introduction of GST, taxation procedure is expected to be much simpler and easier to understand. According to experts, GST is going to be a ground-breaking movement in Indian indirect tax structure. The existing tax mechanism between the state and the centre will go through a complete overhaul with the implementation of GST. Being a value-added tax, GST aims to do away with the cascading effect on goods and services cost . GST has paved the way for total refurbishment of existing tax architecture in India as it is going to impact incidence, structure and computation of indirect taxes. Currently, 15% service tax is levied on services which comprises of 14% basic service tax, 0.5% Swachh Bharat and 0.5% Krishi Kalyan Cess. With the implementation of GST, consumers have tom pay just one single tax. 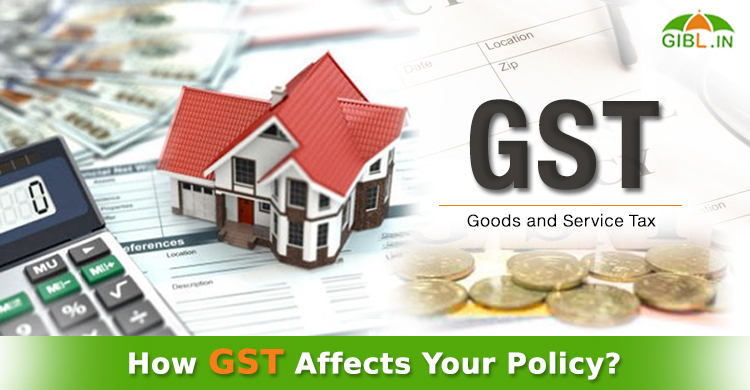 The GST Council is entitled to ascertain the rate of GST in various services and products. How will GST Influence Insurance Sector? Like all industries, insurance sector is also swayed by the introduction of GST including insurers and policyholders. Life, health and motor insurance policies are now costlier as taxes have risen by 3 %.The consequence of GST on different types of insurance plans is more complex than a flat 3% hike on some particular types of insurance products. With GST coming into effect, premium of life insurance plans will be in the range of .3% to 3%. The tax rates for Term and unit-linked plans' tax rate will see a 3% rise and will go to 18% from existing 15%. The first-year premium of annuity products will also rise to 4.5% from 3.75%. Renewal premium of annuity products will rise to 2.25% from 1.88% and single premium of annuity products will be revised to 1.80% from 1.50%. GST is charged on interest applicable on premium received after a delay. The rate will depend on premium type. Policyholders who need to pay alteration fee or fees for preparation of duplicate policy also have to pay these charges with GST. According to experts, increasing cost will affect life insurance sector adversely. GST will discourage common people from availing life insurance covers for themselves and their family members. Just like life insurance sector, GST has impacted the general insurance sector as well. Car, health and travel insurance policyholders now have to pay 18% GST instead of the existing 15% service tax. GST rate will be 18% on fire insurance, marine insurance plans as well. Corporate policyholders, who availed general insurance policies will have to pay GST on their policies. However, they get input tax credit on GST. Before the advent of GST, the input tax credit was available to them even under service tax. This table shows the revised tax rates of several different types of insurance products available in India after the introduction of GST. Are All Types of Insurance Schemes Coming under GST? Life insurance provided by Government schemes are excused from GST. Here is a list of schemes in which GST is not applicable. Life insurance provided by Central Government to members of the Army, Navy and Air Force. Any other State Government insurance scheme notified by Government of India on the recommendation of GSTC. Is General Insurance Sector being Denied? Input tax credit is not available in the service tax structure designed for insurance business. Policyholders can't avail input tax credit as these policies are devised for personal purpose. Even corporate policyholders who avail group health and life insurance for their employees don't get input tax credit. In the newly introduced GST regime also insurance is exempted from the benefits of input tax credit. However, the industry is hopeful that the government will remove the exemption and insurance will not feature in the revised exemption list. How Much Extra You have to Pay on Your Insurance Premium? As far as the consumers are concerned, the increasing premium outgo is the most significant impact of GST on insurance. A middle class family that spends around Rs. 30,000 in car, health and term insurance will have to shell out around Rs. 1000 more every year from now on. According to experts, insurance companies in India will assess impacts of GST and in course of time if they find any positive impact that will reflect on the premium without changing the GST rate. Any Silver Lining in GST Cloud? Implementation of GST will prove to be beneficial for policyholders only if input tax credit is applied in insurance. However, GST structure is very complicated and confusing and it also may trigger higher administrative costs for insurance companies. If these costs are not passed on to consumers, prices might stay low. Tax rate on insurance plans are not the same as it depends on the type of insurance plan, mode of paying premium and the likes. As of now, it is not clear if GST will come into play or is exempted from these parameters. Small ticket insurance policies and insurance plans which are sponsored and promoted by government-are excluded from the ambit of GST. According to experts, micro insurance or insurance plans below a certain threshold should be exempted from the purview of GST. Apart from the premium hike, application of GST will bring some deeper and far-reaching implications in India's insurance market. Let's take a look at some of them. As GST triggers a hike in insurance premium, insurance companies in India will compete with one another to gain maximum number of clients. All insurers will come up with lucrative deals to entice consumers and customers will reap the benefits of increasing rivalry among insurance providers in India. In coming days, insurers might minimize expenses for issuing policy and intermediary commission in order to lower insurance premium as an effort to recompense for the increased tax that comes with the implementation of GST. It is an undeniable fact that purchase of insurance will be more expensive as GST comes into effect. However, the merit and importance of an insurance policy doesn't solely depend on its premium. On the contrary, consumers should come up with a holistic approach to gauge the true value of insurance covers by considering all its aspects including policy coverage, policy term and exclusions. It is of utmost importance that an individual, especially if the individual is the only earning member of the family to secure his or her life and health from ailments and personal accidents. Insurance policies not only shield one's financial losses but also keep the families financially protected in the absence of the policyholders. Broadly speaking, insurance premiums have risen as GST has come into force. The hike might appear negligible for a single insurance policy, however, collectively a family's yearly insurance premium expense might reach a substantial figure. If you have term insurance, health insurance, car insurance and personal accident insurance plans in place and you pay around Rs. 50,000 each year, you might have to shell out another Rs. 1500 without getting any additional benefit. The real impact of GST on insurance still remains to be seen. As of now, GST has only increased insurance premium, its other consequences will be observed in coming days. Why it is Important to get your Business Insured? Budding Sachins are well-covered in India, why not budding Baichungs? Should I Buy Insurance from Public Sector or Private Insurer?